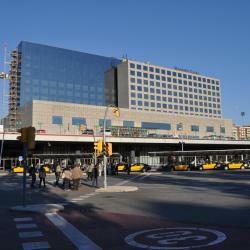 Looking for hotels near Girona Metro Station? El Palace Barcelona is located in Eixample District, close to the Ramblas, the main shopping area and Barcelona’s main tourist attractions. It offers a Mayan-style luxury spa. The Best Barcelona offers a 1-bedroom apartment with free WiFi and a terrace with views over Barcelona and Gaudi’s masterpiece Sagrada Familia, located just 1640 feet away. 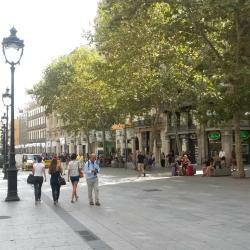 Paseo de Gracia Bas Apartments Barcelona is centrally located, just an 8-minute walk from Plaza Catalunya and Las Ramblas. The The 8 Boutique B&B is a luxury guest house just 164 feet from Gaudí's Casa Batlló in the trendy Passeig de Gràcia avenue. It offers attractive rooms with free Wi-Fi. Located next to Barcelona’s Passeig de Gracia Station, this boutique hotel offers a stylish lounge. Rooms include a flat-screen TV and free WiFi. Super friendly staff. Everyone is very helpful and always wears a smile. 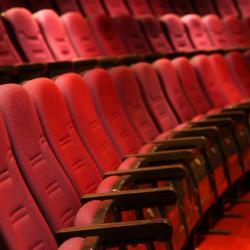 Hotels with great access to Girona Metro Station! Including a free breakfast buffet, Hotel Margot House is located in Barcelona. This hotel is set in front of Casa Batlló, at number 46 in a residential building in the heart of Passeig de Gracia. Rooms are comfortable, breakfast is fantastic and the staff are amazing! Located on the fashionable Paseo de Gracia, within 5 minutes’ walk from both Gaudi’s masterpieces Casa Battló and La Pedrera, Monument Hotel offers luxury services including a gourmet restaurant and a... Very helpful staff and great location. 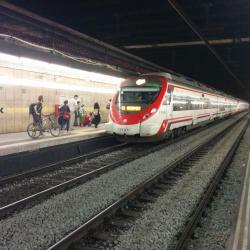 People are talking about Girona Metro Station! Explore guest hotel reviews featuring "Girona Metro Station"
The staff was incredibly friendly and helpful. The hotel feels hipster. The reception desk is also the cafe downstairs. The bed was comfortable and there was a good shower. Quiet. Close to Girona metro station.